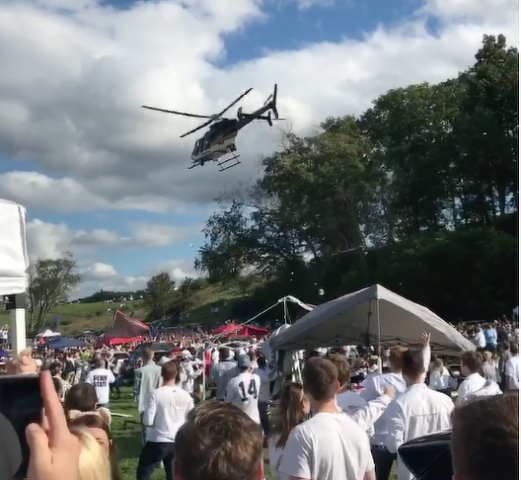 Four Penn State students have been charged with allegedly selling alcohol and providing alcohol to minors at a large-scale Penn State tailgate last fall that precipitated the controversial use of a low-flying state police helicopter to disperse the crowd. Police said in criminal complaints filed on Wednesday that Mark D. Lunney, Jr., Joshua A. 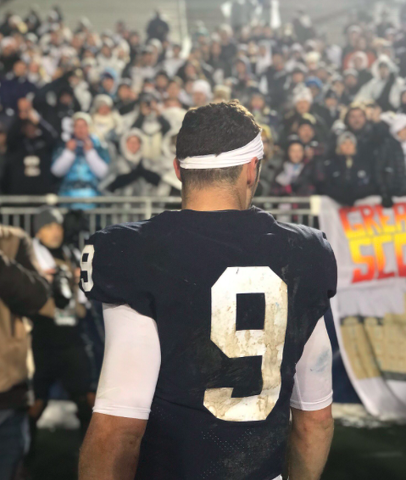 Spear, Connor P. Fitzgerald and Jared P. Bouer were the organizers of the tailgate party that swelled to about 600 people in a Beaver Stadium parking lot prior to the Oct. 29 Penn State-Ohio State game. Undercover officers from the Pennsylvania State Police Bureau of Liquor Control Enforcement learned of a large party in Lot 23, with 13 bouncers from local bars stationed along a perimeter set up with vehicles and tents, according to the complaints. The undercover officers allegedly were able to purchase wristbands for $10 that allowed them to enter and would entitle them to beer, liquor, food and cigarettes. About 10 tents within the party were stocked with alcohol, police said. Officers also said they observed attendees entering without showing identification and saw several several participants using smelling salts, which they were told "were used to bring you around if you drank too much so you can keep on drinking and also to help you sober up to get into the game if you had drank too much." Police have previously said multiple people were cited for underage drinking at the tailgate. Through the afternoon, the party grew to hundreds of people, officers said, and at 4 p.m. a detail of uniformed police officers attempted to disperse the tailgate. As previously reported, a tactical mounted unit joined officers on foot in an attempt to break up the party, but police said the crowd became "unruly" and ignored officers' commands. One person was charged in October for striking a police horse and resisting arrest during the incident. Police deployed a low-flying helicopter to disperse the crowd via loudspeaker. Video from the scene showed the helicopter flying so low that it sent tents and other debris flying through the air, leading to criticisms that it could have caused injuries or other damage. Penn State said at the time that a helicopter would not be used for dispersal pending further review. The Federal Aviation Administration's Flight Standards District Office conducted an investigation but has not released any results. Officers said that at the scene, Spear and Fitzgerald were identified by the bouncers as the organizers in conjunction with 18 fraternities and sororities. Both men allegedly admitted to being "in charge" of and planning the tailgate. Police learned through an investigation that wristbands had been sold prior to the tailgate using the Venmo app, under the event name "Senior Tailgate," according to the complaint. In October, police executed search warrants on the apartments of Spear and Fitzgerald, seizing their iPhones and laptops, as well as sketch plans for the tailgate from Spear's residence. Fitzgerald voluntarily provided his Venmo information, police said, and an officer observed large currency transactions, including a $1,300 deposit he said was his cut from the tailgate. Fitzgerald, a member of Beta Sigma Beta, later wrote in a statement provided to police in January that he became aware of a tradition for fraternities and sororities to hold a tailgate party at home football games. He allegedly said that he, Spear, Lunney and Bouer decided to organize the tailgate for the Sept. 1 game against Appalachian State and the Sept. 29 game. However, he also said that while wristbands were sold for $10, they did not include alcohol, according to the complaint. He said the organizers purchased parking passes, tents, tables, cigarettes, catering, cups, snacks, water, soda and outdoor games, as well as the rental of speakers, a generator and a DJ. Spear, a member of Sigma Alpha Mu, provided a similar statement to police. Police said Bouer did not return an officer's phone calls and Lunney did not follow up on calls for a possible interview. Both were informed in January they would be charged in the case, according to the complaint. All four were charged by summons with misdemeanor counts of sales of malt or brewed beverages for consumption on unlicensed premises, unlawful sales of liquor and furnishing alcohol to minors. Preliminary hearings are scheduled for March 13.